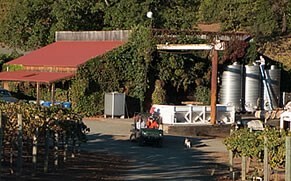 Smith-Madrone is a small winery located in the Spring Mountain District of Napa Valley. Founded in 1971 by Stuart Smith, managing partner and enologist, the winery’s vineyards, which are part of a 200-acre ranch sit at between 1,300 and 2,000 feet on steep slopes which range up to 34%. Its vineyards are dry-farmed and produce about 4000 cases of estate-bottled wine annually. Brothers Stuart and Charles Smith are the vineyard managers and winemakers of Smith-Madrone Winery. Stuart studied viticulture at UC Davis and developed special expertise in dry-farming. Originally a K-12 teacher, Charles joined his brother in the vineyard in 1973. Smith-Madrone wines are well made and pleasant drinking. Their portfolio consists of four wines: Riesling, Chardonnay, and Cabernet Sauvignon and the super premium Cook’s Flat Reserve. This is the IWR’s first review of three of these wines, and we are impressed with the quality of winemaking. Cook’s Flat Reserve, not reviewed here, is their top-of-the-line super premium proprietary Bordeaux blend made in tiny quantities in selected vintages. The next vintage of Cook’s Flat Reserve, which is not yet released, will be 2012. Smith-Madrone 2014 Riesling Napa Valley ($30) 90 The 2014 Riesling from Spring Mountain is light straw in color and highly aromatic with a floral nose, stone fruit and up front tropical fruitiness. Medium-weight with good density, it is not a complex wine but is easy drinking and offers considerable pleasure. Smith-Madrone 2014 Chardonnay Napa Valley ($32) 92 The 2014 Chardonnay is a delicious wine, perfectly balanced, lean and beautifully sculpted with a rich mouth feel. It seamlessly combines ripe orchard fruit and toasted oak in a lovely format that is very food friendly. Smith-Madrone 2013 Cabernet Sauvignon Napa Valley ($50) 93 The 2013 Cabernet Sauvignon is sourced from the Smith-Madrone Spring Mountain estate. It exhibits dense, rustic, lush mountain flavors of black currant and cassis with hints of red berries. A beautifully crafted wine, it reveals firm round tannins and a persistent finish. It is drinking well now but will improve with age and last up to a decade. This entry was posted in Cabernet Sauvignon, California, Chardonnay, Red Wine, White Wine, Wine Type and tagged Napa, Spring Mountain. Bookmark the permalink.